Here's a cute layout using one of Wicked Princess Scraps kits, Acid Rock, which you can find here. Great kit for your favorite 'Emo' girl!!! Baby Layouts w/Just another lullaby PTU kit! (and a Saint's Superbowl victory!! Wooohhhhoooo!!! So, my Birthday was Feb. 6th. What TWO GREAT presents did I get, you ask?? 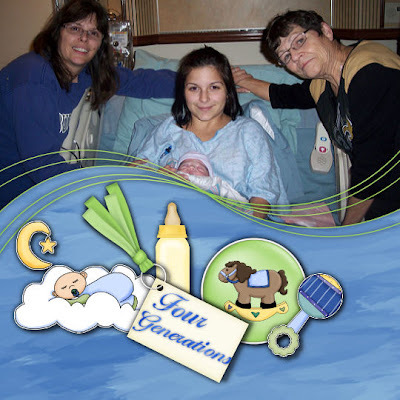 My second Grandson being born on the 4th, a handsome lil man who had trouble in the beginning of his lil life now all that is left is jaundice, so hope he'll get better for his homecoming soon!! Ohhhhh~~~~the 2nd present was the Saints winning the Superbowl last night!!! I know my dad is dancing and crying in the heavens above right now!! Just like the Who Dat nation all over town...kids w/Who Dat? signs and horns blowing on every street corner!! A night to remember, people crying everywhere and Men who swore they'd wear dresses if the Saints made it and/or won it!!! And YES there were a few in my crazy family that did!! Such a funny sight to see!! But, boy what a feeling after 43yrs...FINALLY going to the Superbowl and winning it to boot!! oh and it was my 43rd Bday...go figure!!! wooohooo!!! P.S...I woulda been proud even IF they hadn't won that Superbowl Championship...just that they made it to the Superbowl was awesome!! People planned to meet them at the airport, win or lose, when they came in from Miami!! 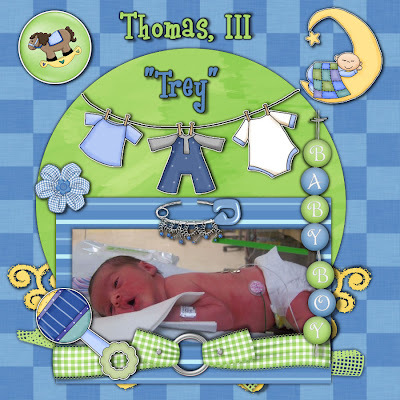 So, here are some layouts I made of my new Grandson, Thomas, III, "Trey". Made with a wonderful PTU kit by Nikki of Creative Intentionz and can be found here. Thank you Nikki for allowing me to use this kit! !